Do you feel tired and weary? The turn of winter and spring is ideal for remedial procedure. Detoxication with vegetable and fruit juices will strengthen your immunity, regenerate your organism, and improve your psyche. Welcome the sunny weather with vitality and good mood! The detoxication work is done by your liver, kidneys, lungs, skin and intestines. Their function depends on the genetic preconditions and the state of health of the individual. Detoxication disorders can manifest themselves in fatigue and stress, sleeplessness, physical weakness, constipation, low libido, or high cholesterol and high blood pressure. In such cases, alimentary canal detoxication is the first step to the recovery of the organism. The cleansing ‘diet’ of only six glasses of fruit and vegetable juices a day should be kept for three days. But even one day will be a benefit for your body! But if you are a vegan, you can go on for a week. Thanks to the liquid consistence, you can squeeze more healthy food into one glass than if you tried to crunch it in the solid state. Moreover, your body will process their nutrients much faster. If you don’t have a juicer, just mix the fruit and vegetables and make a nutritious smoothie. Don’t you know what kind of juice to make? In every glass, there should be a vegetable, preferably a green one. Beginners will probably treat themselves to a larger share of fruit; however, those who are sensitive to sugar and suffer from yeast infections shouldn’t overdo it. The advanced ones will manage purely vegetable pick-me-ups. 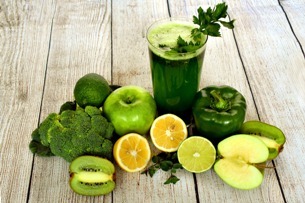 How to shop for juice detox? For mixed smoothies or juices, buy ripe or almost ripe vegetables and fruit. If they are too soft, you won’t get a fresh liquid but a puree of a poor taste. Always try to get organic products, but if it’s not possible, choose fruit and vegetables with a thicker skin that can be peeled off and use only the flesh, for example, banana, avocado, melon, orange, or grapefruit. The “clean food”, protected against pesticide sprays, includes also onions, sweet potatoes, asparagus, and aubergines. Curly kale, broccoli, beetroot or cucumber are ideal for vegetable juices. You can drink a vegetable drink full of chlorophyll as a morning pick-me-up, and in the evening, you can treat yourself to filling nut milk in the last sixth glass. During the day, a strong lemonade with lime and chili will keep you energetic. After you wake up, drink a glass of hot water with lemon (which doesn’t count as one of the six juice glasses a day for detoxication). You will appreciate this drink all year long, not only during the cleansing period. It will start you organism and make you feel well.